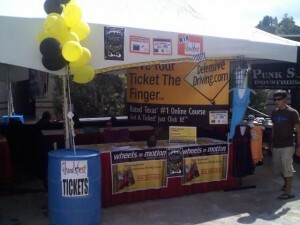 DefensiveDriving.com was at Buzzfest XXV in the Woodlands this past weekend. What a fantastic turnout! Thanks to everyone who came by our booth. We gave away 3 sets of Ghoulsfest tickets – Congrats to the winners (pictures will follow in another blog). It was great to hear all of your driving and traffic ticket stories. Thanks for sharing. Log in today to www.DefensiveDriving.com to take Texas’ first online driver safety training course! Remember, you can save up to 10% on your monthly insurance premiums for THREE years for the low price of $25 for the course. And don’t worry, if you get a ticket after you get your insurance discounts started, you can take the course again for ticket dismissal! DefensiveDriving.com offers Fleet Driver Training and Company Driver Training. Corporate discounts available! For details, call 888-545-5422. Rock On and Drive Safely!! !